Twenty is a typical weeknight crowd for Manhattan's Deli and Pub in Newport News, Virginia, but tonight—a Tuesday—the Pocket Poker Aces League is hosting a poker tournament. It's only the second time they've appeared at this location, but word has already spread and tonight over 200 people pack inside. Eight tabletop shells blazoned with player markings and cut with slots for chip racks quickly transform one dining section into a casino floor. Early-comers sit at the tables riffling poker chips on green felt as standbys gather at the nearby rails. The tournament is a free-roll, meaning no one pays to play, but that doesn't spoil the intensity. Ten minutes into the action, a twenty-something guy in a green fleece pullover stands up at one of the tables and scratches his three-day stubble. He stabs the air with his cigar, pointing at a thin, middle-aged man in a polo shirt and wire-rimmed glasses. "Man," green fleece says, "I want you to call. Why do you think I went all in?" Behind the loudmouth stands his two-man posse, their baseball caps turned backwards. They clap him on the back and egg him on. "Yeah, yeah, you the man!" Green fleece bobs and weaves, scooping the air in a come-hither gesture to induce a bet from his opponent. "Come on in, man," he begs. "It'll be just me and you." The yuppie chews his thumb a moment longer then pushes all his chips into the pot, creating a stir amongst the standbys at the rail. Green fleece shakes his head and sits back down, looking like he's been kicked in the gut. He flips his cards onto the table, exposing a horrible hand: jack-six, unsuited. A few players chuckle and someone says, "I thought he was bull-shitting." His opponent, looking even more sheepish, turns over a 10 and 8 of hearts, and the whole table laughs. The dealer quickly plays out the remaining cards and when no one's hand improves, green fleece raises his arms in triumph and lets out a whoop. The yuppie slinks away, one of the railbirds slips into his seat, and the deal moves on. It's poker night in the suburbs and this is the closest any of these participants will ever get to the World Series of Poker. Just a few short years ago, the scene at Manhattan's would have been impossible to imagine. Poker was an unsavory game played by stogie-chomping men with bleary eyes, not something to be found in reputable establishments. Even at casinos, poker was relegated to tiny rooms that were out of the way and hard to reach. Pit bosses couldn't imagine that a game almost as boring to watch as golf could actually generate "fans." Hours could go by at the table with stone-faced players saying little more than "call" or "raise." So, with all that going against it, why has interest in poker grown exponentially over the past five years? The short answer is Hollywood. For the long answer, you first need to understand how poker came to be. Poker is an American invention. Born on Mississippi riverboats, it grew up through western expansion and over the course of the Civil War evolved into the form we know today. Though, to give it proper credit, one must first acknowledge poker's European heritage. Poker's ancestry dates back as far as the 1500's, when Spaniards were playing a similar three-card version called Primiero. Various other "vying" games also relied upon a ranked order of cards or tiles to determine a winner coupled with methods for deceiving opponents. When vying games came to America, they landed in New Orleans in the early 1800's. At that time, settlers were playing a French game called Poque, a card game that used only the "royal cards," aces, kings, queens, jacks, and tens. Southerners pronounced the French word as "Poke-uh" and the "er" was added at a later date. The game spread through the country by means of Mississippi riverboats, where it was referred to as "the cheating game." By the 1830's, the 20-card game had grown to include 52 cards so that more people could play; the flush—five cards of the same suit—was added as a combination and poker was born. Throughout the 19th Century, poker's popularity grew with the westward expansion of the country. Exploratory and adventurous by nature, American frontiersmen quickly took to the game and poker tables cropped up in just about every saloon. Though trailblazers embraced poker, sentiments changed as wagon trains headed west and brought with them a fundamental dislike of the game. Known gamblers were sometimes run out of town. Poker seemed unable to get past its origin as a cheating game. When Wild Bill Hickok was shot dead in a poker game while holding two pair—aces and eights, which has since been known as "the dead man's hand"—poker's outlaw mystique multiplied. Civil War soldiers, worried that the game was satanic, would often leave decks of cards behind when going into battle. Even so, the soldiers kept on playing and the game continued its evolution. During the Civil War, another hand was added to the rank of possible winners—the straight, consisting of five sequential cards from any suit—and other variations sprouted up, most notably draw and stud poker. The draw significantly changed the aspect of poker as it provided a second betting interval and allowed players to speculate on the possibilities of hands that might be worthless at the moment but could be winners if only the right card were dealt. In 1875, the joker was added as a wild card. Then the final development in poker came with the addition of community cards, which is the basis of the current Texas Hold 'Em. In 1919, Wild Widow was the first game to introduce this concept. Wild Widow, later renamed Spit in the Ocean, is regular five-card stud with an additional card placed face up in the center of the table. Whoever has the best hand combining the community card with four cards from his hand wins the pot. The final evolution of poker came in the form of tournament play, which didn't change the structure of the game but the manner in which it was played. Though viewed as the birth of this style of play, the first "tournament" had only two players. In 1949, Benny Binion staged a high-stakes poker marathon at the Horseshoe Casino in Las Vegas, pitting Nick "the Greek" Dandolos against the legendary Johnny Moss. Players paused only to sleep, and after five months of play the "the biggest game in town" ended when the Greek stood up, bowed, and said, "Mr. Moss, I have to let you go." Public scrutiny of the tournament led Binion to recreate a battle of poker giants in 1970, which he named the World Series of Poker. The winner of this game would be crowned world champion and their picture would remain on the Horseshoe's wall. The following year, a "freezeout" was added to the competition, meaning that players were gradually eliminated until only one remained. Johnny Moss won the first two tournaments and was finally dethroned by Amarillo Slim Preston in '72. The tournament gained popularity but never exceeded 50 players in Benny Binion's lifetime. It seemed destined to remain a backroom game with a somewhat seedy reputation. Which brings us back to our original question—why has poker grown so much recently?—and our short answer: Hollywood. In 1998, Miramax released the movie, Rounders, in which Matt Damon plays card shark Mike McDermott. The movie opens on McDermott entering a basement card room with a thick roll of bills in his pockets. As he walks up to the cashier's cage, Damon gives enduring advice in a voiceover for all wannabes: "Here's the thing. If you can't spot the sucker in the first half hour at the table, then you are the sucker." Throughout the film, Damon describes table action with insider lingo, leaving the viewer feeling wise enough to judge if players hit their door card, missed the river, or if they're holding a sucker straight or the nuts. Over the next few years, poker game room attendance spiked and card sharks swallowed the flood of guppies. Rounders made poker more popular, but it didn't erupt onto the scene until two poker enthusiasts, Steve Lipscomb and Lyle Berman, came up with the idea of using poker in a reality TV show. They proposed televising the action at the final table of a poker tournament until only one player remained. Major networks and cable affiliates laughed them out of their offices, so Lipscomb and Berman decided to produce the show themselves. After finding investors to bankroll the project, the Travel Channel gave them a prime time slot. The World Poker tour was launched in 2003 and the country will never be the same. To make the show work, Lipscomb and Berman had to transform the traditional image of players cradling cards to their chests so others couldn't peek into something that would play well to an audience. The most popular games—draw and stud poker—wouldn't work because there was no way for spectators to know what was going on until the cards were flipped over at the end. And then, only if the bettor was called. For the participants, every minute detail holds their attention and the night can fade into dawn without their notice, but for fans, the opposite is true and minutes can stretch into hours. So Lipscomb and Berman chose a more fan-friendly game for tournament play: Texas Hold 'Em, otherwise known as the "Cadillac of Poker." In Hold 'Em, five cards are placed face up on the table for everyone to see. The WPT then installed cameras in the table so viewers at home could see the two cards each player had "in the hole." Finally, live commentating by knowledgeable hosts left home game players feeling like pros. Spectators could not only follow the action, they also knew more about the hand than the guys holding the cards. When someone threw chips in the pot on a stone-cold bluff, viewers could watch his opponent wriggle in discomfort and fold a hand that would have won. By their second year, the WPT was the Travel Channel's highest rated show, earning a Neilsen rating that was three times higher than the network's average. Stations that had previously scoffed at Lipscomb and Berman's idea were now scrambling to add their own versions of the WPT to their schedules. ESPN was first, televising what the poker world calls the "Main Event": the World Series of Poker. Then NBC's affiliate, Bravo, followed suit, adding celebrity poker to their prime time lineup. Now, you can pretty much find a poker show on some channel any day of the week. If you have the cash on hand for the entry fee, you can even participate in the tournaments yourself. Unlike other televised sporting events, any average Joe can wind up in the finals and get his face on national television—a premise proven out by the past three winners of the World Series of Poker, each of whom were amateurs. In fact, the 2003 winner (Chris Moneymaker) and the 2004 winner (Greg Raymer) earned their seats at the tournament by winning online games with entry fees less than $50. Hoping to follow their examples, thousands more flocked to the once Spartan tournament. Participation tripled from 839 in 2003 to 2576 in 2004, then doubled again to 5618 in 2005. The cash payout for the winner also grew, from $2.5 million in 2003 to an astounding $7.5 million in 2005. Big poker tournaments are not the only places where a card shark can earn some money. 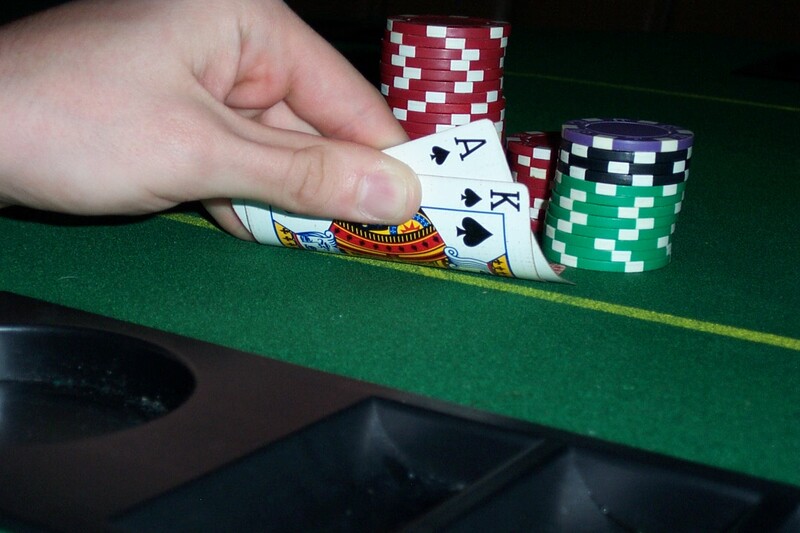 Cash games can be found in almost every city (find one near you at: www.homepokergames.com). Of course, most states require that the game be played in a private residence and have various restrictions on how a game can be run. 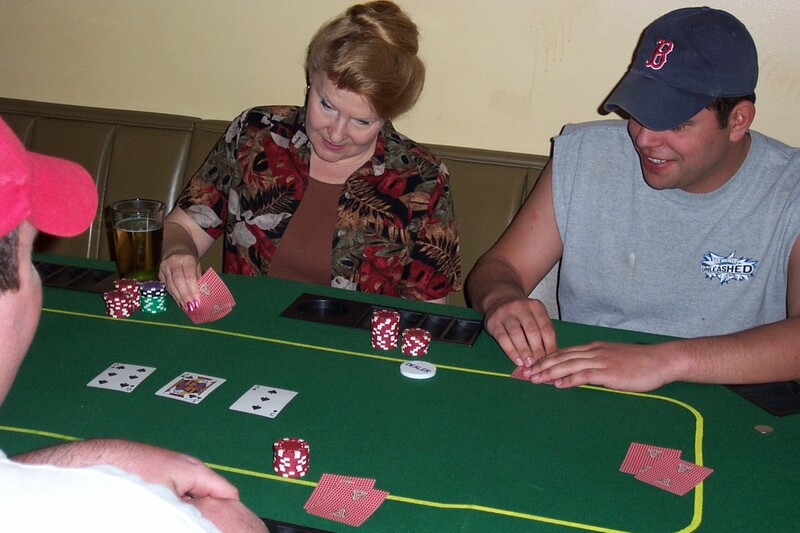 In Virginia, for example, it is legal to play a cash poker game in a private residence; however, if the person hosting the game takes a rake (money skimmed from the pot to offset operating costs), charges a fee to play, or even if he charges for food and beverages, the game is deemed illegal. The host is guilty of a felony and everyone else playing is guilty of a misdemeanor. Of course, there are other issues you should consider before playing. Though it's possible to win big money playing poker, it's also possible to lose big money. With great rewards come great risks. And if you're planning a game with friends, you shouldn't want to "win big" in the first place. No-limit poker may look fun on TV, but feelings can get hurt when real money is on the line. When someone signs the title to his car over to you in a "friendly" game, don't expect him to remain a friend for long. To keep the game friendly, a good rule of thumb is limiting the buy-in to an amount that will keep the game interesting but won't ruin anyone's bank account. Please remember, gambling can be addictive. If you or someone you know has a gambling problem, call The National Problem Gambling Helpline at 1-800-522-4700 for confidential help, or visit www.ncpgambling.org for more information. If the pot always went to the player with the best hand, then the winnings would even out over the course of the game. Usually, though, the same players end up with a mountain of chips in front of them time after time. Why? Because they bet against the strength of other players' hands instead of betting on the strength of their own. To win consistently at poker, you must be able to read other players' tells—any behavior or reaction that provides information about your hand to others—and successfully bluff when their hands are weak. It won't matter if you have lousy cards as well. If you act first and bet strong, others will be too intimidated to call if their hands are weak. The semi-bluff: Betting strong when you have a good draw and a chance of winning is called a semi-bluff. By betting strong, you can often scare your opponent into thinking you have a better hand than you do. Even if he doesn't fold, he might simply check to you during successive rounds, letting you stick around without costing you anything. Stealing the antes: If everyone has folded before you and you are the next to last person to act, it is often wise to bet strong, thus encouraging the last person to drop out and let you take the antes. Over time, a lot of small pots can add up to big winnings. Exposing cards: Generally speaking, it's unwise to show your cards to other players when it isn't required. If everyone else folds his cards, you are not required to show yours. If you do, that provides the other players with information about your betting habits. Information that they can use against you later. The only time that showing your cards is a good ploy is when you've played a hand so contrary to your normal manner that showing the cards will make the other players think you have a different style. If you're a tight player and you just bluffed with a weak hand, exposing the cards at the end might make everyone think you're looser than you really are. Showing low cards that one time might induce others to call you more frequently than they would otherwise. Acting weak/acting strong: Everyone sitting at a poker table is going to lie. In doing so, their words and overt actions often indicate the opposite of the actual strength of their hands, which is the first and most important "tell" to look for. Others can be as minor as a nervous tic or as obvious as slapping your forehead when you bluff. Body posture: When a player has a good hand, he will usually sit more erect. Looking away: When a player looks around for something else to engage his attention, it is usually because he is trying hard to look disinterested. Beware. He's deceiving you and has a strong hand. Long pause: If a long pause if followed by a call, that might not mean anything. But if a long pause is followed by frustrated gesticulations or a "Oh, what the hell" type comment before raising the pot, the player is trying to make you think the decision is tougher than it really is. He probably has a monster.